This is the oddest thing, I couldn't work out how they did it. I leave my key in a draw far away from the front of the house to stop any remote scanners but my girlfriend also sent me a photo of a strange chip on the door handle that was never there before. It made me think back to when I locked myself out of my E39 years ago by leaving the key in the boot before I closed it. The AA man checked a database and found the solution to unlock my car. He said I should really look away while he did the solution but let me watch as I must have an honest face haha He put a wedge between the back of the boot and the C Pillar to expose a cable. He then shorted that cable and all my doors/boot unlocked with no alarm!! I do wonder if the chip was a result of something they used to access a cable behind the door handle? That’s 5h1te Michael, gutted for you. 😦 How did they actually unlock it and get in? was there damage to the locks / car? Thanks. Really nice. I have the embossed head rest but not the arm rest. BMW 520D M sport. Perfect support vehicle for carrying the Caymans track wheels. Gen 1 marmite example, but I love it..
My local specialist says you can remove the glass and clean them up inside, then glue back and seal with some clear sealant or similar. He reckons it a common problem. Maybe its possible to spray the reflector silver when you have cleaned it up. 2004 Polo 1.9 SDi. 150,000 miles 60mpg Non-turbo diesel £600. Makes the Porsche feel colossal in comparison. My wife has a 2019 Mercedes E-Class for when the dogs need to travel with us. Its great when you find a good dealer. i purchased my Cayman from Cavendish Porsche in November 2017 and found the entire experience very pleasant and easy I could not fault them. It gives you a much better level of confidence in the car even if there are a few niggles. Great looking cayman as well. 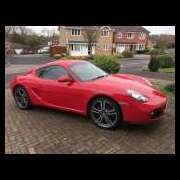 I bought my Cayman from them last October. Very Good garage to do business with..
Not one for me. The orange just doesn't look good in my opinion. Not to my taste either, did see it a couple of weeks ago on Auto Trader, it’s kinda right in your face but would of looked better without the bonnet stripes. Guessing the text on graphics is some kinda private joke .......... each to their own though. What tyre pressure are you running on track?